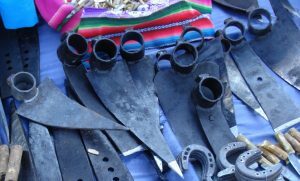 Andean farmers have used iron tools since colonial times, including plows, harrows, picks, shovels and hoes. 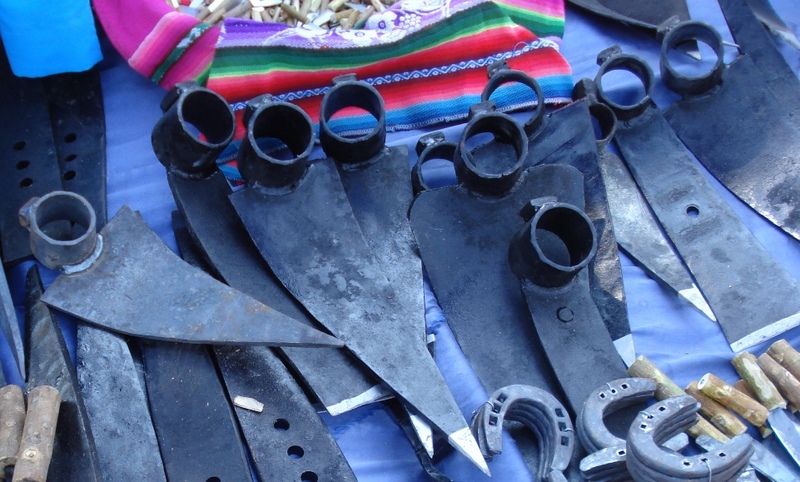 A favorite Bolivian tool is a long, triangular hoe, known as the qallu (Quechua for “tongue”). The qallu is ideal for working the steep rocky potato fields. Many farmers never leave home without their qallu. 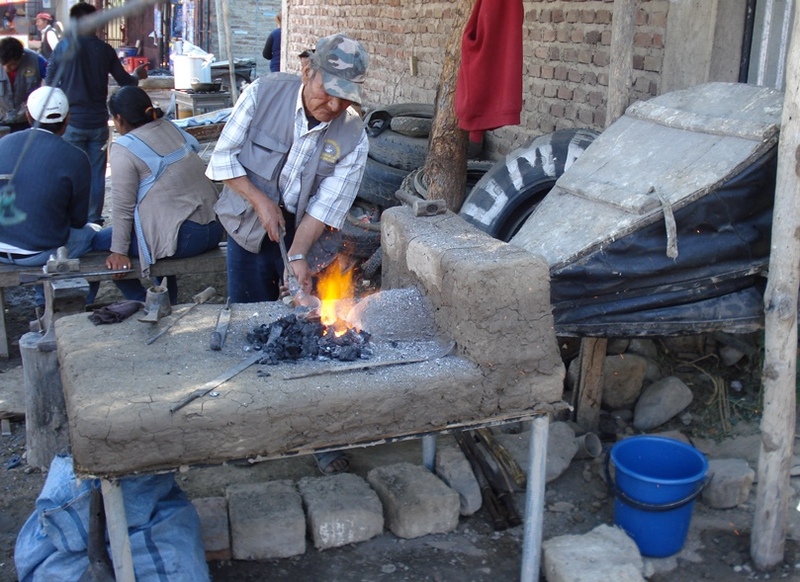 In the valley of Cochabamba, the village of Ironcollo is home to the blacksmiths who make qallus and other tools. Ironcollo is strategically sited near the small market city of Quillacollo on the valley bottom. 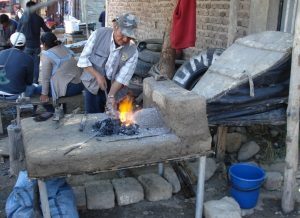 Farmers coming from the high Andes to shop in town can stop in Ironcollo on the way and have tools repaired or buy a new one. Ironcollo is an old place. It is built over an archaeological mound, a large, artificial hill created gradually over the centuries as each generation of pre-Colombian people built their houses on the ruins of the people before them. Today the villagers are unsure exactly how long their ancestors have been working iron in Ironcollo, though they told me they were well established before the War for Independence from Spain, and that they made weapons for fighters in the Battle of Falsuri (1823). I have no reason to doubt them. The narrow main street of Ironcollo is lined with shops, many of them owned by blacksmiths. I saw a large, industrial-made wood and leather bellows lying in the dust by one front gate. The label, pressed into the hardwood, says that the bellows is a model No. 102, made by Alldays and Onions of Birmingham, England. A museum in Marlsborough, New Zealand displays another copy of the same model, imported from Britain before 1888. Not only have the blacksmiths of Ironcollo been connected to global trade for some time, but their nineteenth century ancestors were making enough money to buy themselves decent equipment. But times are tough now in Ironcollo. Where there were once 70 blacksmiths shops, there are now 30. Cheaper steel tools from Brazil and China are eating into their market. Not that the blacksmiths are going down without a fight. In 2011 they started holding an annual fair, inviting the public to stroll through the village and see how iron tools are heated in a charcoal forge until they are red hot, and then skillfully pounded into shape on an anvil. We saw many tools on display in Ironcollo, but none of the larger ones were fitted with handles. No one was even selling handles at the fair. The smiths’ customers were still largely hardworking smallholders who know how to whittle a tree branch into a hoe handle. 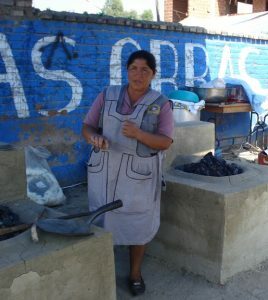 Some blacksmiths have responded to changing market demands, making coat-racks and decorations for city people.My wife Ana and I met a woman blacksmith, doña Aidé, who took over her husband’s forge when he died, so she could support her children. The kids are grown up now, but she continues to make heavy-duty rakes that she designed herself. She also invented a new recipe, which she calls “the blacksmith’s dish” (el plato del herrero): steak cooked right on the hot coals of the forge, which she sells to visitors at the annual blacksmith’s fair. 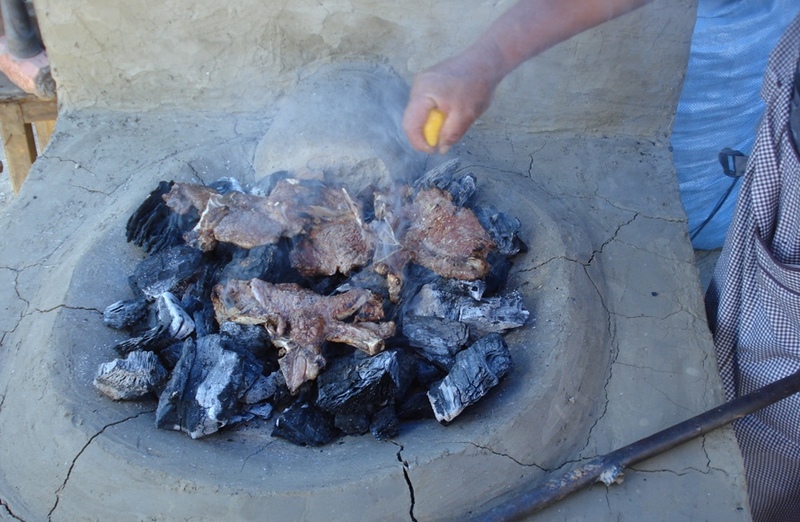 An older blacksmith, don Aurelio, designed a new style of blacksmith forge, with a built-in electric fan. This saves labor, since the blacksmith doesn’t need an assistant to pump the bellows to fan the flames of the forge. Don Aurelio’s family makes and sells the electric forges to other smiths in the community, and beyond. In 2013 the blacksmiths of Ironcollo formed an association. Community leader Benigno Vargas explained that they hope that this will be a way of getting support from the government, which is much more likely to fund a community group than unorganized family firms. But with or without official support, for now local farmers are still keeping the blacksmiths in business. These blacksmiths have technical innovations, like the electric bellows and the coatracks and other metal products, but they have also innovated socially, with the annual fair, a professional association, and even a new way to prepare steak. Near the end of the short main street, an elderly farmer stops us to admire the heavy, green rake we bought from doña Aidé. The farmer is from a remote village, and speaks little Spanish. She asks us in Quechua how much we paid for the rake before she marches off, wondering if she should invest 40 pesos in such a fine tool. Innovative farmers need imaginative tool makers who are tied into the local tradition of farming. Family farmers make many of their own tools. Access Agriculture has videos for example on making a rabbit house, making a quail house and other devices. Many of the videos show how farmers use different tools. When farmers watch the videos, they are often interested in the tools they see in the videos. Farmers around the world also rely on mechanics and other artisans to make and repair some tools, like the conservation agricultural tillage equipment for tractors and tools drawn by animals. Grafting is the surest way to get the fruit you want. If you grow a fruit from the seed, the new plant may not be the same as the one you planted. Although grafting was practiced in ancient Greece and China, even American trees like avocados can be grafted, as my agronomist wife, Ana Gonzales, recently explained to me in Cochabamba, Bolivia. Ana has been grafting avocados for a couple of years now, in part because she knew someone who planted a grove of the small, but tasty Hass variety. He went to the trouble of flying in grafted trees from Chile. When the owner sold his land for a new housing development, Ana wanted to keep the variety going before the trees were all destroyed. She found an agronomist who ran a nursery and was willing to show her how to do the grafts. The second year she practiced on her own, and although she lost many of her trees that year, practice pays off and she’s pretty good at grafting now. The first step is to grow the rootstock. We save all of the avocado seeds or pits at our house. We soak the pits in shallow water for a few days, before planting them in soil in a black plastic bag. It may take a year to grow into a seedling big enough to graft. When you cut a tree you open the door for pathogens, so Ana starts by washing her tools in soapy water and disinfecting them with a weak bleach solution. She cleans the tools after working on each tree to avoid spreading fungi and bacteria which might kill the little plant. 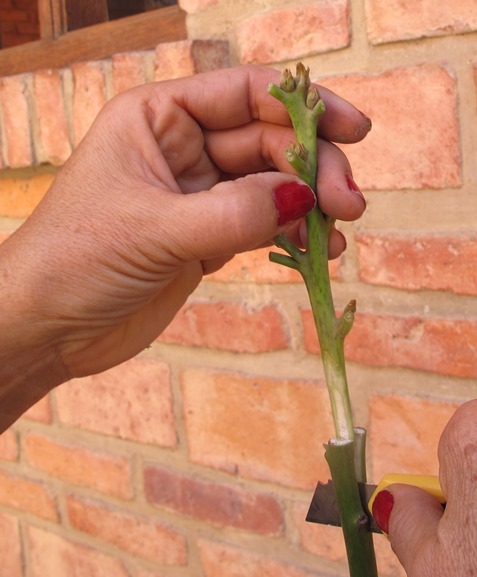 I am a bit surprised when Ana takes the pruning shears to a flourishing seedling and cuts off its entire, leafy top. Now it looks more like a pencil than a tree. She uses a razor to slice a vertical cut into the stump of the decapitated seedling. This is going to be the rootstock of a new tree. Next, she takes the scions, the small branches she has cut from the tree she wants to reproduce. 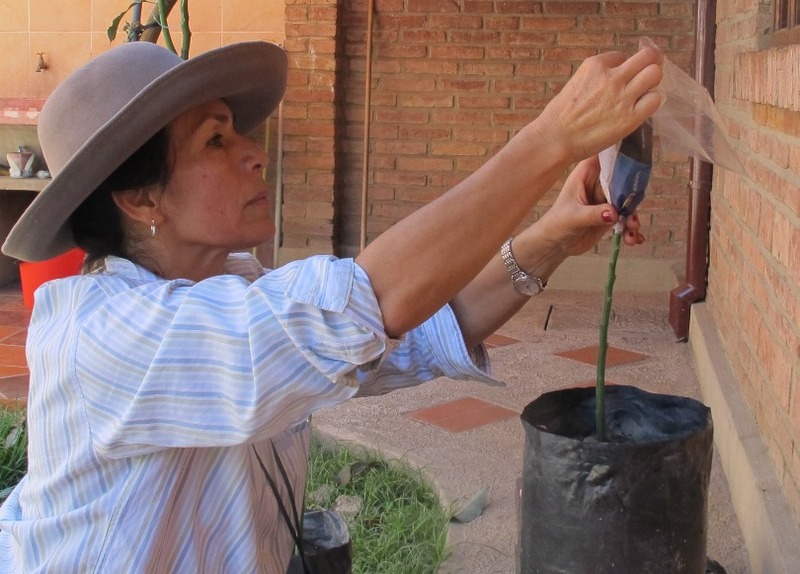 When Ana began, she would go to orchards in the Cochabamba Valley to look for Haas avocados. She got several scions from trees still left on that housing estate that had once been an avocado grove. But it is better if you have the donor tree closer to hand. 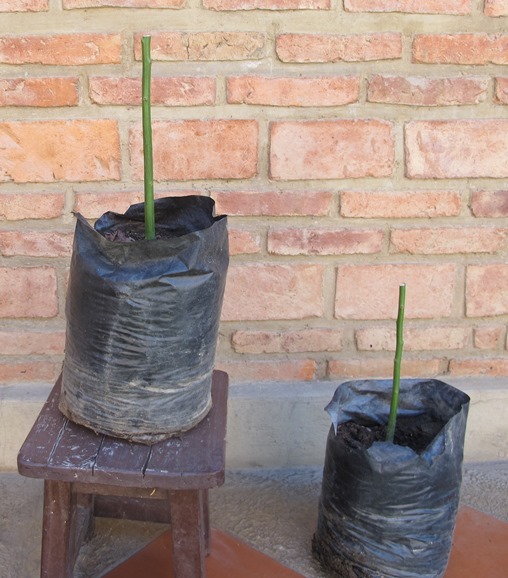 Freshness really matters in grafting. The rootstock and the scion should be about the same diameter. Any mismatch in size and the two pieces of living wood don’t meld. Ana cuts the tip of the scion into a long, thin wedge and gently, but firmly slips it into the razor cut of the rootstock. Ana says that sun and wind can dry out the graft and kill it. So she wraps a strip of paraffin tape around the wound, to bind the scion to the rootstock. She tears off a bit of newspaper, soaks it in water and wraps it around the top of her grafted tree, and then covers the newspaper with a small, new plastic bag and ties off the bottom of the bag, to keep it moist. Ana sells most of the successful grafts, usually to family and friends. 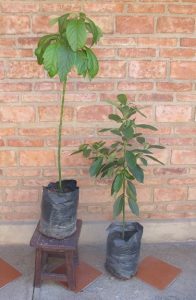 She sold one to a cousin and every time we visit we step out into the garden to check on Ana’s avocado tree, which is doing well. Ana offers a guarantee. If the customer plants a tree and it dies, she replaces it. Most orchard deaths are due to careless transplanting or neglect. You never know what people are going to do to your little tree, but Ana gives her customers the benefit of the doubt and a replacement. She doesn’t want any disappointed customers. Human relations are fragile, like a grafted tree; it’s important to nurture them both. On the 29th of June in Cochabamba, I watched as 39 farmers’ associations met with 183 businesses, in a large, rented ballroom, where tables just big enough for four were covered in white tablecloths and arranged in a systematic grid pattern. 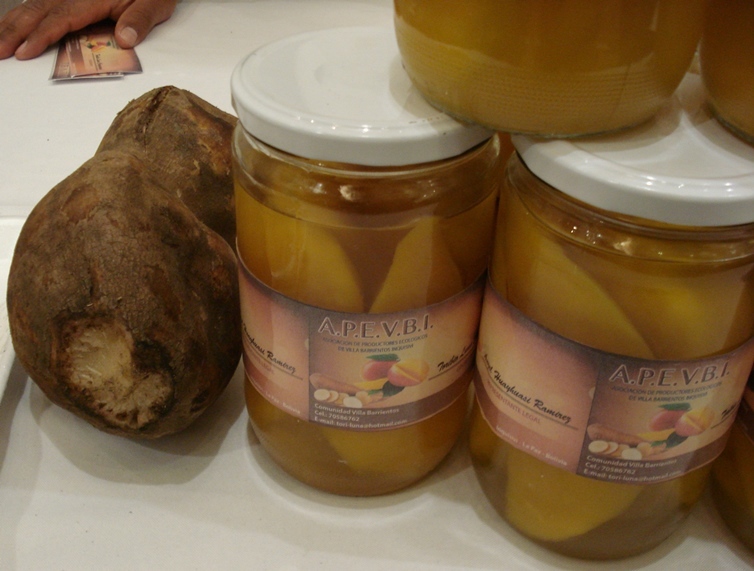 All day long the farmers and entrepreneurs huddled together, in 25-minute meetings, scheduled one after the other, for as many as 15 meetings during the day, as the farmers explained the virtues of products like aged cheeses, shade-grown cacao, and bottled mango sweetened with yacón (an Andean tuber). Some businesses had come to buy these products, but others were there to sell the farmers two-wheeled tractors and other small machines. Each association or business had filled out a sheet listing their interests and products. The organizer used computerized software to match up groups by interest, and set a time for the meetings. The time was tracked by a large, computerized clock, projected onto the wall. At the end of each of the 25 minute meetings, each table filled out a one-page form stating if they had agreed to meet for another business deal (yes, no, maybe), and if so when (within three months, or later), and the amount of the probable deal. By the end of the day, the farmers and the business people had agreed to do business worth 56 million bolivianos, equivalent to $8.2 million. Business representatives came from five foreign countries: Belgium, Peru, the Netherlands, Spain, and Argentina, to buy peanuts and other commodities. But most of the buyers and sellers were from Bolivia and only 6% of the trade was for export. The meeting was self-financed. Each farmer’s group paid $45 to attend and each entrepreneur paid $50. This is the ninth annual agro-business roundtable, so it looks like an institution that may last. Business is a two-way street. For example, one innovative producer of fish sausages made deals to sell his fine products to hotels and supermarkets, but he also agreed to buy a machine to vacuum pack smoked fish, and another deal to buy trout from a farmers’ association. Miguel Florido, facilitator, explained that in previous years the roundtable brought in $14 million in business, but that was mostly with banks and insurance companies, signing big credit deals, or insurance policies. Now the money amount has dropped a bit, but people are buying and selling tangible, local products, which is what the farmers want. It can be difficult and time-consuming for smallholders and entrepreneurs to meet each other, but with imaginative solutions buyers and sellers can connect. Acknowledgment: this roundtable was organized by Fundación Valles and Fundesnap. El 29 de junio en Cochabamba, observé mientras 39 asociaciones de agricultores se reunieron con 183 empresas en un salón de eventos, lleno de mesas que eran el tamaño perfecto para cuatro personas. Todo el día los agricultores y empresarios se juntaron, en reuniones de 25 minutos, hasta 15 reuniones durante el día, donde los productores explicaban las bondades de productos como quesos añejos, cacao producido bajo sombra, y frascos de mango endulzados con yacón (un tubérculo andino). Algunas empresas vinieron para comprar esos productos, mientras otros estaban en plan de vender motocultores y otras pequeñas máquinas a los agricultores. Cada asociación o empresa había llenado una hoja detallando sus intereses y sus productos. El organizador usó software computarizado para juntar los grupos según sus intereses y fijar una hora para sus reuniones. La hora se controlaba con un reloj grande y computarizado que se proyectaba a la pared. Al final de cada una de las reuniones de 25 minutos, cada mesa llenaba un formulario indicando si habían quedado en volver a reunirse para hacer negocios (sí, no, tal vez), y cuándo (dentro de tres meses, o más tarde), y el monto probable del trato. Al fin del día, salió que los agricultores y las empresas habían fijado tratos por un valor de 56 millones bolivianos, equivalente a $8.2 millones. Asistieron empresas de cinco países extranjeros: Bélgica, Perú, Holanda, España, y la Argentina, para comprar maní y otros productos. Pero la mayoría de los vendedores y compradores eran bolivianos y solo 6% de la venta era para exportar. La reunión era auto-financiada. Cada asociación de agricultores pagó $45 para asistir y cada empresa pagó $50. Esta es la novena rueda anual de agro-negocios, así que parece que es una institución duradera. El negocio es una calle de dos sentidos. Por ejemplo, un productor innovador de chorizos de pescado quedó en vender sus finos productos a hoteles y supermercados, pero también compró una máquina para embalar su pescado ahumado al vacío, e hizo un acuerdo para comprar trucha de una asociación de productores. Miguel Florido, facilitador, explica que en los años previos, la rueda trajo hasta $14 millones en negocios, pero mayormente con bancos y aseguradoras, firmando contratos para créditos o seguros. Actualmente se mueve un poco menos de dinero, pero la gente vende y compra productos tangibles, locales, que es lo que los agricultores quieren. Agradecimiento: La rueda de agro-negocios se organizó por Fundación Valles y Fundesnap. 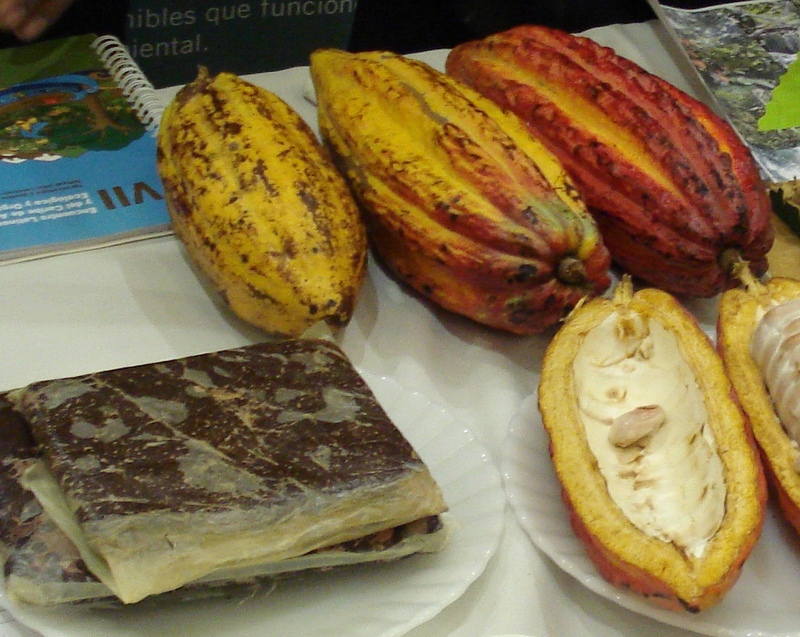 Chocolate reached Spain in 1528, after the conquest of Mexico. The Spanish soon found that cacao could be mixed with sugar and pressed into a solid disk or tablet, to mix with hot water to make a drink. For the first time in history chocolate was sweet. Manufacturers in Mexico still sell boxes of chocolate disks, sweetened and spiced with cinnamon. The chocolate is hard and dissolves slowly, so it must be vigorously beaten into hot water, but the frothy drink is worth it. By the 1700s, chocolate was a fashionable drink throughout Europe, and its popularity soon led to other innovative uses, for example in confectionary. In 1847, in Bristol, England, Joseph Fry invented bars of chocolate by adding cocoa butter back into Dutch chocolate, along with sugar, and pressing the mixture into molds. Fry’s Chocolate Cream Bars debuted on the market in 1866, but the confection was still somewhat bitter, and sales were slow. From 1869 to 1887, Daniel Peter, a chocolate maker in Vevey, Switzerland, experimented with ways to add milk to improve the bitter flavor of chocolate. The challenge was to remove liquid from the milk, add sugar, and blend it with chocolate before the mix spoiled. Early attempts were often rancid or tasted of bad cheese. But Peter’s hard work paid off, and chocolate was being sold in the UK under the Nestle brand by 1901. By 1900 other manufacturers (including Milton Hershey in Pennsylvania) were also selling factory-made chocolate bars in America. Allied troops in the Second World War were issued chocolate tablets (with oat flour added to prevent melting). Soldiers often used the chocolate as gifts or trade items. Paul Van Mele’s older relatives in Belgium recall how the British soldiers gave chocolate to the local families who offered them food and accommodation. Since those optimistic days at the end of World War II, chocolate has continued to change, not always for the better. Manufacturers often substitute partially hydrogenated vegetable oil for cocoa butter, and use the chocolate as a simple coating for cheaper candy. So food evolves, fueled by the creative experiments of innovators who were stimulated by new commercial opportunities. The Age of Exploration and the Industrial Revolution both offered new foods, which the public craved, including the seductive taste of chocolate. As with other kinds of technologies, old food recipes often persist alongside new ones. In Mexico and parts of the USA you can still find the delicious mole, often made now with chicken instead of turkey. The sauce even comes conveniently packaged in class jars. So chocolate still survives, in at least some places, not just as a candy, but also as a drink and a main dish. Boynton, Sandra 1982 Chocolate: The Consuming Passion New York: Workman Publishing. Daniel Peter – The inventor of milk chocolate. Vea la versión en español a continuación. When five, roughly rectangular blocks appeared on the mountainside high above Cochabamba, I assumed they were just fields of oats. The pale green shade seemed about right for the feathery grain, and the cool climate was ideal for oats. However, social media soon turned the checkered slope into a mystery. Cochabambinos began writing into a popular website to ask about the odd shapes. Some rushed in with answers. 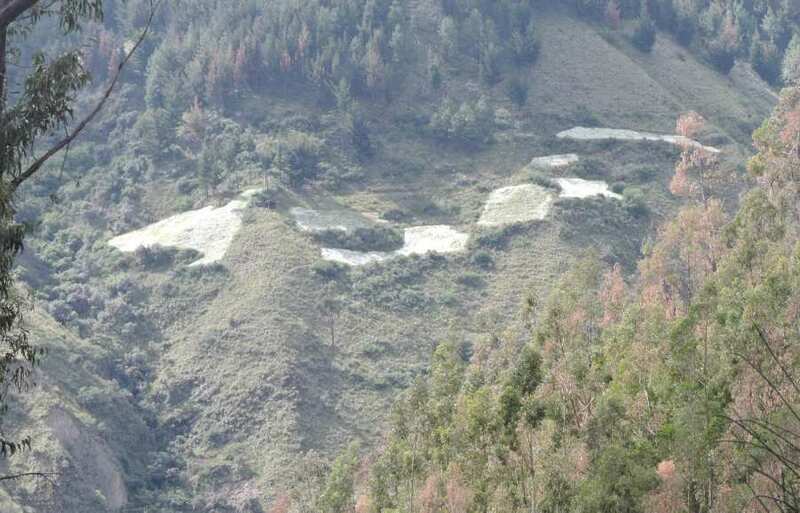 There was even one far-fetched suggestion that the blocks were fields of ripening coca, even though this narcotic shrub only grows in much lower and wetter country. Some thought the patches were just oats. Others said they were wild flowers, sprouting where fields had been left fallow. My wife Ana wrote to say that the patches were so light that they could only be the brilliant white flower, known as ilusión in Spanish. Her suggestion was ignored, so one sunny afternoon, Ana and I decided to check out the fields first hand. Although the fields with the mysterious blocks are as visible as a beacon, the Bolivian bourgeoisie are not avid hikers, and few of the city dwellers know how to get up onto the slope. We drove up one of the steep, narrow roads, peeked over a few ridges, and finally spotted the ivory-colored fields up close. It wasn’t quite like finding Machu Picchu, but it was delightful to see five little plots of ilusión. Called “baby’s breath” in English, this hardy flower (Gypsophila muralis) is a native of northern Europe and Siberia, but has adapted well to the Andes, where it has become a poor person’s commercial crop. Baby’s breath has few pests and thrives on poor, stony soil. It is a low-input, low profit crop: a cheap flower that is complements and enhances bouquets of roses. A mourner with just a few spare pesos can buy a handful baby’s breath to take to a funeral. The fields were surprisingly small, each just a few meters wide. They made up no more than a hectare all together. There were no houses near the fields, which were being tended by some absentee, peri-urban farmer, who trusted the isolated spot to keep his or her flowers hidden in plain sight, much to the bewilderment of the townsfolk below. Every crop whether food, fiber or flower has its own signature color. A person who knows and loves plants can spot the difference between illusion and reality from miles away. Cuando aparecieron cinco bloques, más o menos rectangulares en el cerro arriba de Cochabamba, me supuse que eran parcelas de avena. El tono verde claro parecía más o menos el del grano plumoso, y el clima fresco era ideal para la avena. Gracias a los medios sociales, los cuadraditos en la ladera pronto se volvieron un misterio. Los cochabambinos empezaron a escribir a una página web popular para preguntar qué eran las formas extrañas. Algunos se apuraron con respuestas. Había hasta una solución equivocadísima que los bloques eran parcelas de coca, a pesar de que el arbusto narcótico solo crece en zonas mucho más bajas y húmedas. Algunos sí pensaron que las pequeñas mantas eran avena. Otros dijeron que eran flores silvestres, que nacieron donde las chacras se habían dejado en descanso. Mi esposa Ana escribió diciendo que las formas eran tan pálidas que solo podrían ser la brillante flor blanca, conocida como ilusión. Nadie hizo caso a su sugerencia; así que una tarde asoleada, con Ana decidimos descubrir las chacras de cerca. A pesar de que los bloques misteriosos son tan visibles como un faro, la burguesía boliviana no es muy fanática de las caminatas en el monte, y pocos de los citadinos sabían llegar a la falda de la serranía. En el auto subimos unos caminos angostos e inclinados, echamos un vistazo sobre algunos filos y al fin vimos de cerca los campos color de marfil. No era exactamente como encontrar Machu Picchu, pero nos encantó ver a las cinco parcelitas de ilusión. 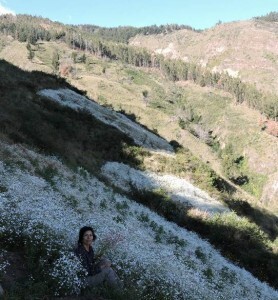 La ilusión (Gypsophila muralis) parece delicada, pero en realidad, es un robusto nativo del norte de Europa y de Siberia, que se ha adaptado bien a los Andes, donde se ha convertido en un cultivo comercial de los pobres. La ilusión tiene pocas plagas y prospera en el suelo pobre y rocoso. Es un cultivo de baja inversión y baja rentabilidad: una flor barata que complementa y enriquece hasta a un ramo de rosas. Una persona que solo tiene dos o tres pesos en el bolsillo puede mostrar su respeto al muerto, llevando un ramito de ilusión al entierro. Nos sorprendió que las chacras fueran tan pequeñas, unos pocos metros de ancho cada una. Las cinco no sumaron a más de una hectárea. No había ninguna casa cerca de las parcelas, que eran cultivadas por algún agricultor peri-urbano pero ausente, que confiaba en el lugar aislado para proteger a sus flores, escondidas en plena vista, desconcertando a los vecinos de la ciudad en el piso del valle. Cada cultivo, bien sea alimento, fibra o flor tiene su propio color único. Una persona que conoce y ama las plantas puede ver la diferencia entre ilusión y realidad a kilómetros de distancia.